It’s always an advantage for a band to have more than one principle songwriter. In Wolf Parade composing duties are split evenly between Spencer Krug and Dan Boeckner. As far as which is the stronger force here, it’s hard to tell. Their interplay was key in the success of their first album, Apologies to the Queen Mary. Both individuals have their own voices and their own lyrical obsessions, but are able to reach a common chemistry. 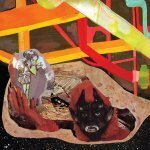 On Wolf Parade’s sophomore effort, At Mount Zoomer, Krug and Boeckner still complete each other, albeit in a more roundabout and ultimately less satisfying manner. Pushing in several directions, this album reaches further than the debut. It manages to be sprawling in scope, but still plays it safe. Krug brings the more ethereal and otherworldly tones while Boeckner keeps things closer to rock roots. Swirls of synth occasionally lie just underneath the surface, but clean keys are used more frequently. The sonic blips and whirls are placed with such tact that they are valuable without ever being overbearing. Soldier’s Grin starts things off with terse interlaced keyboards and guitars, followed by the dense and ghostly Call it a Ritual. Already the contrast between Krug’s and Boeckner’s styles is apparent. Language City is where things begin to get comfortable as everything builds toward an explosive final 30 seconds. Over the course of the album Krug yelps about radio waves while Boeckner howls of broken cities and isolation. Obtuse? Of course it is, but no matter how jagged the melody or how esoteric the subject matter, there’s still the propensity to sing along. California Dreamer, with its frantic, madcap energy and the punchy guitars of The Grey Estates are standout tracks, while An Animal in Your Care again employs the “deliver the goods at the very end” tactic. The band withholds the decadence until the 11 minute, shape-shifting closer, Kissing the Beehive. With a tidy nine tracks, At Mount Zoomer seems like it would be trimmed of any unnecessary filler, but somewhere in the second half things begin to wilt with only shades of interesting ideas. Apologies to the Queen Mary managed to be one of 2005’s best by mixing the weird with a considerable amount of hooks. With At Mount Zoomer Wolf Parade has some exciting and challenging tactics, but the payoff simply isn’t engaging enough.